>Try putting "climate refugees" into a search engine. >By this I assume you are making a reference to Bangladesh. Try putting Deforestation and flooding into a search engine and see what you get. AGW is the scapegoat governments use for inaction. I’m never going to argue that deforestation is not causing lots of problems! I was think more of small island states where govts are organising mass evacuations and marginal habitable areas around Africa where war and genocide are triggered by diminishing resources. Actually, it’s not native, it’s introduced. But having said that, it could survive further south but the main climate related problem with this particular mosquito is in fact that people are now storing more water due to unreliable rainfall and providing habitat for the mozzie. In general however, there is a high risk that higher altidude high population centres in poor countries that have previously been free of diseases like malaria will become prone to malaria. If they spread into western countries, the impact won’t be anywhere near as great as we tend to have the resources to deal with it. None of which changes the facts that I completely agree with, that deforestation, overpopulation, poor water and living conditions cause or exacerbate lots of problems. I just don’t think it’s helpful to create a “this issue or the other” debate out of it – its important to deal with a whole stack of issues right now. >Next you'll be telling me polar bears are facing extinction. Well, I’m a bit more concerned about Australia’s animals. We do have the highest rates of extinction, particularly of small-mid sized mammals, anywhere in the world. >reason to believe CO2 has caused the increase - more the other way around. You are assuming that increases in temperature result in more CO2 emissions from oceans? If so, are you taking into account the increases in CO2 absorption because the atmospheric CO2 concentration is greater? Can you pls explain why, in your opinion, the increased water temp will override any effects of increased CO2 absorption from higher atmospheric CO2 concentrations and result in a net increase in CO2 emissions from the ocean. I think Tony B was making a similar point but failed to elaborate on it. You guys carry on, but I'm pulling out, as of right now. I've had enough. The madness of trying to decide if the climate is changing via debate on a climbing forum has finally got to me. I started out from the view that you guys have just missed something, some piece of science, or an understanding of the IPCC and made my best efforts to educate you so you don't feel disenfranchised as the rest of the world starts responding to this problem. Instead, we're bogged down in discussions about railway engineers, Maunder effects and other nonsense, when really the science has been proven, by scientists mind you, not climbers, years and years ago. What we have proven, beyond any shadow of a doubt, and I include myself in this, is that humans have an awesome capacity to read what they want from something, and only listen to the views that support their own already held views. Buggered if I know what to do about this, but it makes democracy a problematic form of governance, in that to get what you want, you need to convince others that it is a good idea. But the facts still stand; the important people of the world, the decision makers, financiers and a bunch of important scientists and scientific bodies think the climate is changing, humans are causing it and that we should do something about it, and a lot of them have already done something about it. Resisting this will probably only lead to a life of anger and sadness, as you watch the Governments of the world piss your money up the wall to try and stop fairies at the bottom of the garden. This is your choice, and I hope you have fun dealing with it. I want to concentrate on how we deal with the problem, and if anyone wants to get involved in that debate, you know where to find me. In the mean time, I want to go climbing, and I will be this weekend if the weather holds. As I keep saying, show us the evidence then ! I will compliment Evan of having had the strength of conviction to say that his view was based on ice cores. Unfortunately, ice cores show that CO2 increases are an effect of temperature increases, not a cause. This was actually demonstrated 2 years before Al Gore's movie ... not that Al would let the truth get in the way of making a dollar. Further to my last post on Arctic temperatures, the longer trend is even more interesting. Note than man's fossil fuel burning increased greatly after about 1945, as shown in my earlier graph. Arctic temperatures were actually much higher in 1938 than now. The rate of warming in the Arctic was higher before 1938 than after, despite man's fossil fuel burning ! atmospheric temperatures averaged across the continent." Show us the graph from the same research organisation that shows Arctic ice is decreasing. I have gone from mild frustration to bewiliderment and after failing to get reasonable responses, finally moved on to down right taking the p!ss (remember the submarine pics I posted. I think they did pretty the place up a bit). You just keep on coming up with the same old BS. ...Why dont you give senator fielding a call, he will be all ears to your macro and cherry picked graphs (make sure you use only the big fat juicy ones though). Or write a book about the injustices of CO2 mitigation to the struggling inhabitants of wealthy countries and donate the profits to your charitable self. In the future students will study the people who had the foresight and intelligence to radically change the way we look at our world - Copernicus, Newton, Galileo, Einstein and, of course, Tony B. Keep up the great work mate.....Look forward to your next refereed journal publication. >on a climbing forum has finally got to me. Ohh evanbb, don't despair. It was a climber who started all this, there is a connection between climbing and climate change. A discovery in need of a controversy by Stephanie Pane. Tyndall first visited the Alps as a student in 1848 and could hardly stay away. He climbed Mont Blanc several times, made it to the top of Monte Rosa alone with nothing to sustain him but a ham sandwich, and was the first to reach the summit of the magnificent Weisshorn. He would probably have notched up the first ascent of the Matterhorn, too, had his guide not chickened out at the last minute. Between expeditions, Tyndall was busy consolidating his position as one of London's most energetic experimental scientists. In 1853 he landed the plum job of professor of natural philosophy at the Royal Institution, where he investigated an astonishing number of subjects. Not surprisingly, one of them was glaciers. Tyndall wanted to understand how masses of ice such as the Mer de Glace melted and moved down the mountainside. He was also curious about the conditions that led to their formation, which is how in May 1859 he came to be incarcerated in the basement of the Royal Institution investigating the heat-absorbing properties of gases. The year 1859 was one of those nose-to-the-grindstone years. Tyndall was stuck in London juggling his science, a strenuous round of lectures and writing his first book - on the subject of glaciers. He was familiar with the notion of the "greenhouse effect", first mooted in the 1770s and developed in the 1820s by Frenchman Joseph Fourier, one-time secret policeman, governor of Egypt and physicist. Fourier pondered the question of why the Earth was warmer than physics suggested it should be, and concluded that while the light from the sun penetrated the atmosphere easily and heated the Earth, the heat radiated by the Earth couldn't pass back through the atmosphere quite so easily. He suspected that the atmosphere blocked the passage of radiant heat - infrared radiation - from the Earth, preventing its escape into space. A few years later, another Frenchman, Claude Pouillet, speculated that certain gases in the atmosphere were responsible for trapping radiant heat. "This view required experimental verification," declared Tyndall. Physicists had recently studied the heat-absorbing properties of liquids and solids, but the general view was that gases were transparent to heat or absorbed imperceptible amounts. The immediate challenge was to devise a means of detecting the undetectable. Tyndall began to work on a piece of apparatus sensitive enough to register the heat absorbed by a slim tube filled with gas. On 9 May, he tested his apparatus and tried it out on some simple gases. "As yet no effect observed," he wrote in his journal. By 18 May, he had cracked it: "Experimented all day; the subject is completely in my hands." Now he found that air definitely intercepted some heat. He tried more gases, "and with the most remarkable results". The main gases in the atmosphere, oxygen and nitrogen, proved virtually transparent to heat, while more complex, compound molecules absorbed seat much more powerfully. Coal gas -a mix of carbon monoxide, methane and other hydrocarbons - turned out to be as much a barrier to radiant heat as a piece of wood. Further experiments showed that carbon dioxide and water vapour were particularly good at blocking heat radiation, and that it was these gases that were responsible for absorbing most of the heat trapped by the atmosphere. On 10 June, Tyndall demonstrated his experiments before a packed meeting at the Royal Institution, with Albert the prince consort in the chair. "To the eye, the gas within the tube might be as invisible as the air itself, while to the radiant heat it behaved like a cloud which it was almost impossible to penetrate. Thus, the bold and beautiful speculation has been made an experimental fact. The radiant heat of the sun does certainly pass through the atmosphere to the Earth with greater facility than the radiant heat of the Earth can escape into space." And he is remembered by the Tyndall Centre for Climate Change Research at the University of East Anglia, UK. >>on a climbing forum has finally got to me. >is a connection between climbing and climate change. >A discovery in need of a controversy by Stephanie Pane. Far out, that's really interesting. Thanks BA. >>declared "unprecented" by the DPI. >has become wetter over this period, mostly during summer. >along the central east coast. As stated earlier, I like to get as close to raw data, rather than believe the media etc. Have a look at the Aus Bureau of Meteorology http://www.bom.gov.au/cgi-bin/climate/change/timeseries.cgi?graph=rranom&area=aus&season=0112&ave_yr=0 For the past 100 years, there has been little change in rainfall patterns, even for areas like the Murray Darling Basin. If anything, the trend is slightly increasing. Aus has always gone through wet and dry cycles. >around 10 cm from 1920-2000 at the Australian coastal sites monitored. well, too late now anyway... lets just mitigate whatever effects there 'might' be." not going to like it". >>180 years since the Little Ice Age, or the current global cooling trend. Hey Evan, You should have re-read this early post of yours. Thanks for trying to knock some sense into some of these people but you should have given up long ago. The the most ridiculous and insulting thing I continually read from denialists is that human induced climate change theory is a big scam/conspiracy by environmentalists trying to push there cause. So I guess I am a part of this scam seeing that I am a geologist, working on climate change issues and believe we are influencing the Earth's climate. I am also pretty over 16 pages or so of repetition. Tony,I know we addressed that ice core thing pages ago. I think there's a post about Antarctic ice too. Increased precipitation (climate change in a desert ...) leading to more central ice forming etc etc. Pls respond to the responses and stop repeating yourself. RJames, that was a govt dept not the media. Still something seems a bit wrong that people are predominately so upset about this because it costs money. The govt spends lots of $ that I disagree with. Wars in the middle east. Locking up asylum seekers. Subsidies to high profit multinational companies. Building superhighways in preference to improving public transport. In context, a bit of money to address climate change isn't hurting anyone. Literally. 100000 Iraqi civilians haven't died for it. People aren't spending years locked up without charges for it. Since 2001, the US government has spent 677 billion on the Iraq war and 178 billion on Afghanistan. $30 billion does start to look piddly. No problem. "Cherry picking" is an defensive expression very commonly regurgitated by alarmists to escape the reality of the data. I'm happy to look at all the data. Data is only available for 30 years. If I'd chosen March for example, the Antarctic shows an even stronger rate of increase in ice extent of 4.7% per decade !! Note: data download is slow. Here's the past 30 years for the Arctic for the same period, March. 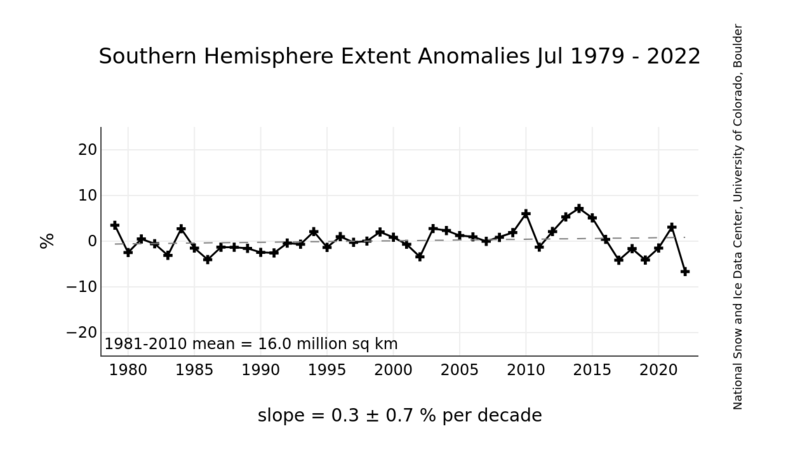 It shows a decrease of almost half the rate of the Antarctic increase ! Arctic temperatures were much higher than currently in 1938. 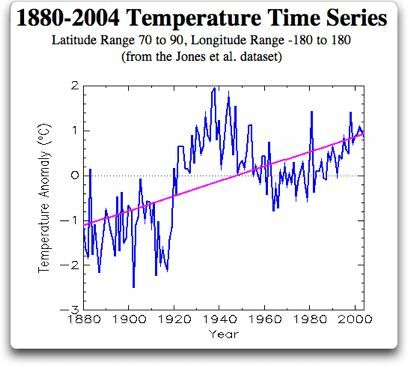 There was a stronger warming trend prior to 1938 than currently. We might expect this to be reflected in the graphs, if such data was available. Your pic didn't show up Tony. I love how you call us "alarmists". It's like a pre-emptive Boy Who Cried Wolf strike, the reasoning being that because they're/we're so worried it must not be true. Genius! I hope you're never in a house fire. I think I'll call denialists Lazy Buggers from now on. You still haven't answered my question either Tony. What if you are wrong? Surely as an engineer you'll have a good understanding of risk mitigation and contingency planning, so, what's your plan if you're wrong on this? At one end we have climate change alarmists at the other sceptic/denialists and in the middle is the 99.999% of people who have an open mind. >Your pic didn't show up Tony. >What if you are wrong? This is also a common argument that is put forth. What you are talking about is insurance of a sort. The problem with that is that there is no guarantee that spending trillions of dollars will have the slightest impact on climate. We could spend that money instead on insuring against all sorts of possible disasters: sea levels which have been rising for the past 6000 years, or meterorites which will certainly hit the earth and kill millions at some point in time. The actual risk must also be considered. You could climb with triple ropes, double helmets, knee and elbow pads ... but is that magnitude of risk realistic ? There needs to be hard evidence that man's CO2 is harming the environment. There is none. However, there are vast amounts of evidence that man is damaging the environment in a myriad of other ways. What is most important is to look at the science of climate; not the politics. There are many factors that effect climate but the most important one is not even considered by the IPCC. Have you noticed how the temperature drops when a cloud passes in front of the sun ? Clouds have a huge impact on temperature. The formation and effects of clouds is very complex and very poorly understood, however in the last few years it has been discovered that cloud formation is strongly influenced by cosmic rays from the sun. The magnitude of the solar wind relates to the number of sunspots. I was fortunate enough in my physics honors class in high school to play with a Wilson Cloud Chamber. The effect of ionising radiation on cloud formation is dramatic. The reason this is relevant is that solar cycles correlate very well with global temperatures (and far better than CO2). Most importantly the sun has entered a period that has not been seen since the Little Ice Age. It appears that this form of solar activity, may be a major reason for the global cooling that is currently taking place. If I'm going to be forced to pay an extra $2050 tax each year, I'd like to see it helping the environment rather than being frittered away on political nonsense. >>What if you are wrong? >about is insurance of a sort. You've dodged again. That response could be summarised with 'we are not wrong. There is no uncertainty.' By talking about probabilities and insurance you're taking us back to your preferred 'scientific' debate. So I'll try again. What if the climate is actually being changed? No discussion of whether or not it actually is or clouds or whether or not there are submarines at the North Pole. How will you respond if you are wrong? Me? I'll apologise for asking everyone to spend $2050 to try and save the climate. Going back to the original topic, check out these floating wind farms being trialled in the ocean. >Going back to the original topic, check out these floating wind farms being trialled in the ocean. Drifting a little from winds farms to something else I can imagine popping up: towers extracting drinking water from air humidity. >about this because it costs money. I agree government money (ours) is wasted all the time. However, the money, and the effect it will have on everybody isn't my main concern. Something this important should be based on good science. That doesn't mean consensus of selected scientists. It means theory that has been tested against real data. To date, this theory has failed this fundamental test. If I, and tens of thousands of scientists, are wrong, I doubt anything we can realistically do will change anything, while we suffer the existing rate of population increase (which I believe is the worlds biggest problem). All this talk of reductions in carbon dioxide of figures like 25% in the next 40 years are just politicians dreaming. The technology for this doesn't look like existing with the current population growth (which in Australia is mainly due to immigration). If I'm right, billions of dollars have been wasted, and many magnitudes more for the future, which could be saving lives, reducing poverty, and even reducing real pollution (which kills people). However, this is not my deciding criteria - as I said, I'm simply not seeing good science. Base it on good science, and it gets my full support.